There is a good reason why Carson’s has been repeatedly nominated as the best buffet in the area. Our premier buffets feature a world-class selection of dishes, for unbeatable prices. Join us weekly for our Friday Night Seafood Buffet, Saturday Night Delallo’s Italian Buffet, and Sunday Brunch Buffet. We also feature a variety of annual holiday buffets, which are sure to please your entire celebrating group! Make reservations, reserve one of our private rooms, or stop in for an amazing all-you-can-eat experience. With award-winning food and services, Carson’s is the best place to have a delectable eating experience. Every Friday evening, from 5pm – 9pm, Carson’s offers a delicious seafood buffet. Come to crack open crab legs, peel some shrimp, sip on clam chowder, and enjoy wonderful seafood salads and a variety of other seafood dishes. If you are not a seafood lover, we also include plenty of other items to choose from, including chicken, carved ham and filet, cabbage rolls, side dishes, and a soup and salad bar! Make sure you save some room for dessert! Enjoy a variety of cakes and pies. 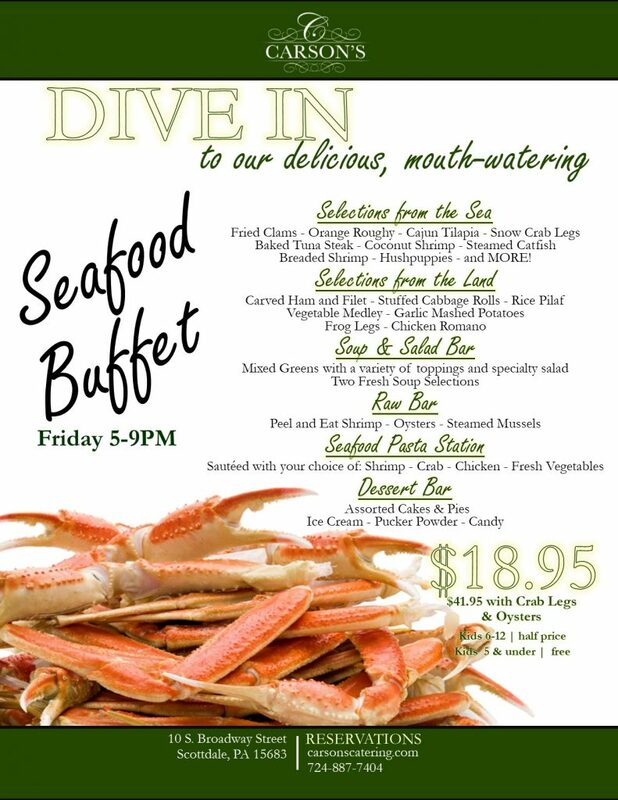 Our Friday Night Seafood Buffet (dessert included) is only $36.95/person with crab legs and oysters, or $17.95 without crab legs and oysters. Children ages 6-12 eat at 1/2 price, and children 5 or younger eat free. The Friday buffet menu may vary slightly from week to week, but you can download our Seafood Buffet Menu for a sneak peak before you come in. Reservations are suggested, but are not required, and can be made online at your convenience. Contact Carson’s for additional information on our weekly Friday night buffets. 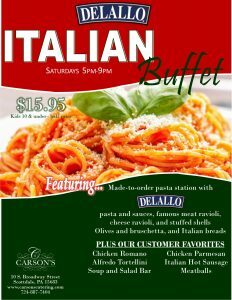 Each Saturday evening, from 5pm – 9pm, Carson’s offers a fantastic Delallo Italian Buffet. Come in to taste our style of wedding soup, enjoy our fresh salad bar with Delallo Olives and Bruschetta, and to savor a wide variety of pasta dishes that feature Delallo pasta and sauces. You will love our Delallo recipes, such as our chicken parmesan, chicken Romano, meatballs, and penne or tortellini with either marinara, Alfredo or fresh pesto sauce. And don’t forget to save room for dessert! You can enjoy our dipping selections for our cascading chocolate fountain, Delallo Biscotti, Pizzelles, and more. Our Saturday Night DeLallo Italian Buffet (dessert and beverage included) is only $16.95/person. Children ages 6-12 eat at 1/2 price and children 5 or younger eat free. Reservations are suggested, but are not required, and can be made online at any time. Contact Carson’s for additional information. The Saturday buffet menu may vary slightly from week to week, but you can download our Delallo Italian Night Buffet Menu for a quick glance before coming in to dine. Contact Carson’s for additional information on our weekly Saturday night buffets. Bring your family and friends to Carson’s for a Sunday Brunch that everyone will enjoy! We combine helpful service, wonderful food, and a pleasant hometown atmosphere to make your Sunday with friends and family extra special. Enjoy an extensive list of breakfast items, as well as our featured Carson’s made-to-order omelet station. Or, if you prefer, a soup and salad bar and a variety of beef, chicken, fish, pasta, and vegetable dishes are also available. No matter what you choose to start with don’t forget to finish off your meal with something glorious from our dessert room, which includes our famous chocolate fountain! Standard breakfast fare is always on the menu, but the luncheon dishes vary from week to week. 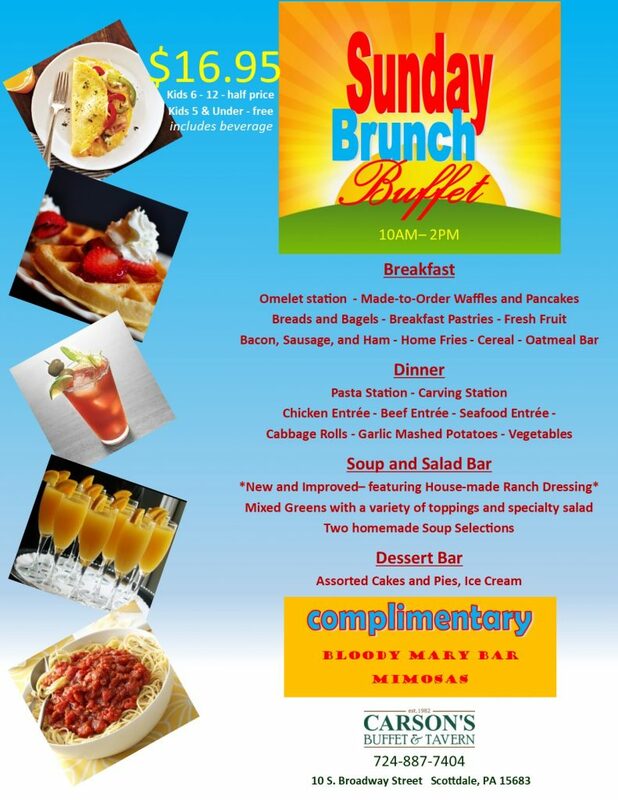 You can download our Sunday Brunch Menu or Contact Carson’s for additional information. You can also make online reservations for a guaranteed spot to dine at our restaurant this Sunday! Brunch is $16.95 for adults, children ages 6-12 eat at 1/2 price, and children 5 or younger eat free. These unbeatable prices now include a beverage of either juice, coffee, or soda. You can even sip on a 1¢ mimosa, or enjoy a Bloody Mary from our new, COMPLIMENTARY Bloody Mary Bar!